Desks come in a wide variety of styles and sizes... bureaux, roll-top, flat desks, Carlton, davenports, etc. 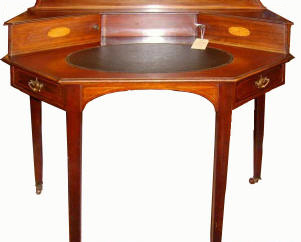 This beautiful neat Rosewood Cylinder Lady's Writing Desk is from Edwardian times with 18th century Sheraton/Hepplewhite inspiration. It has very romantic floral & cherub paintings on the cylinder part. 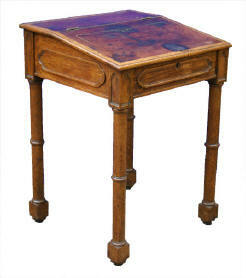 The interior leather top extends for sitting to write and is in good condition as are the decorative inlays and handles. 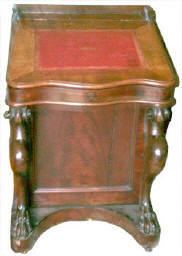 Davenport Attractive Walnut writing slope which lifts to reveal a clean storage area. There is a small lid on top which lifts to to reveal storage for pens etc. The turned legs and open shelf make this a light attractive piece of furniture. 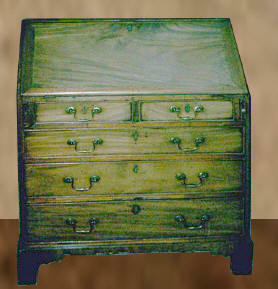 Victorian Walnut Davenport with the traditional 4 full drawers and 4 false at the other side. The writing slope lifts to reveal a clean storage area and there is a small lid on top which lifts to reveal storage for pens and pencils. 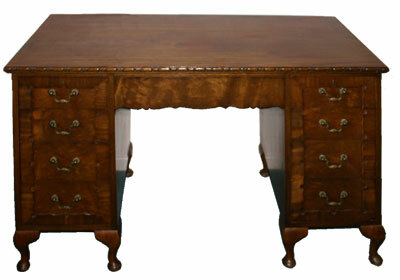 This is an excellent mahogany reproduction piece, with stringing and inlay detail. The original style was designed by George Hepplewhite for George iv when, as Prince of Wales he lived in Carlton House, London. Early Victorian Mahogany Bureau with 2 over 3 graduating drawers. Desk fitted with pigeon holes and small central door. with fine leather on top. At Pitmedden Furniture Workshop our desk stocks are constantly changing and it is not possible to show all available items. 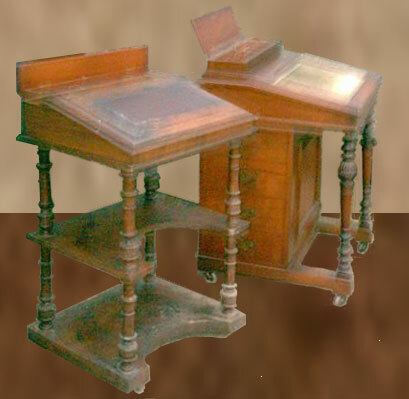 The photographs are examples of desks which we have in stock or which we have recently sold. Whether you would like something similar or something of a completely different style, please contact us to discuss your requirements. We may already have the ideal item in stock or, if not, be able to obtain one from our network of sources.